To work on public speaking and presentation skills, students in 6F5 will become Loudspeakers! They will perform a number of formal speeches this year, in addition to the regular book talks they give in class. The first kind of speech is impromptu, which involves little to no advance preparation. 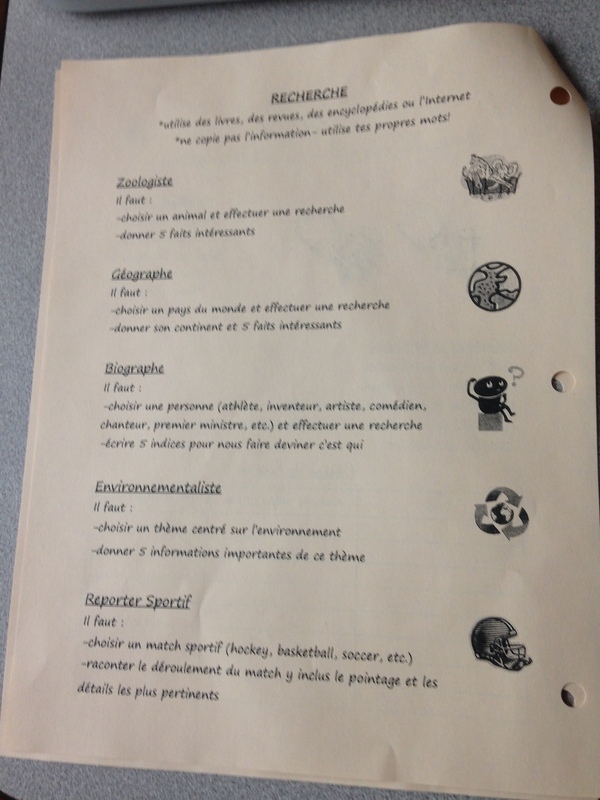 Students choose three topics and bring some notes about each. Right before they present, we roll a die to see which topic they will talk about. Each speech needs to be between 1:30 and 2:00. See the sheet below. Impromptu speeches will be presented Thursday, December 2! Students had time today to work on their topics and notes. Have fun! Just in case you need an extra copy! I apologize this did not post before. Students chose their constellations in class last week. Students in 6F5 and 6F4 have a science quiz Thursday, November 24. Here is what they should know! To launch our writing unit on personal narrative, we are learning about how every person is more than meets the eye. We are considering the statement, “To understand the world, we must understand ourselves.” We began by studying examples of photos and stories curated from Humans of New York, and then we studied student-written examples, such as those from Humans of Biotech. The next step will be to write our on individual take on the Humans-of project, to create a Humans of Room 207 display with a blurb about each student. The purpose of our writing is to inform, and our audience is anyone who visits our classroom, including fellow students, teachers, and special guests. For Thursday,November 17, students need to bring an idea, which they will then workshop in class to develop the first draft of their blurb. Below is a list of questions that can get them thinking. We began our book talks today. Here is the schedule for the rest of the week, along with the criteria we developed a while back in class. Remember that VOICE will be added to the second round. For this round, focus on having complete details in your book talk. It’s time for the Ness Middle School SOUPER BOWL! From now until Wednesday, November 16, bring in canned soup and other canned goods to your homeroom. The class that brings in the most cans by November 16 will win a pizza party! All canned goods will be donated to Winnipeg Harvest. Thanks! It’s time to practice our French public speaking skills! 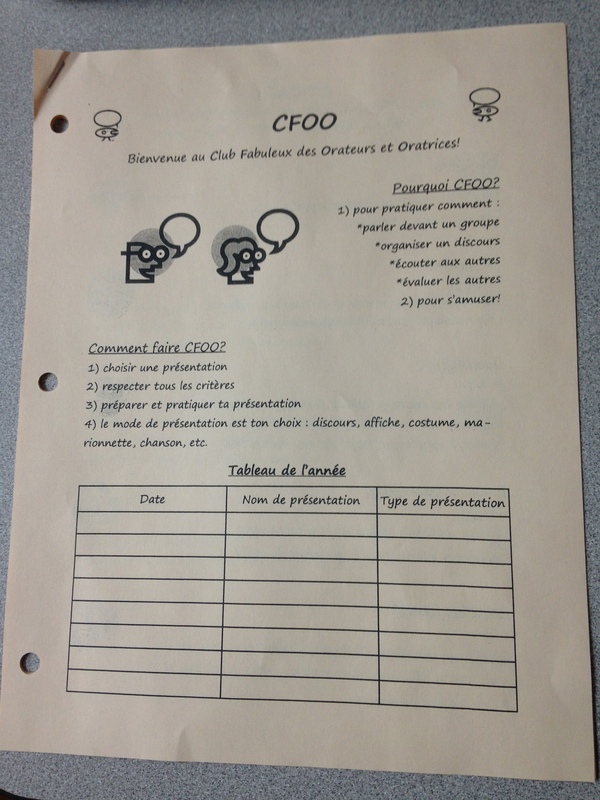 Meet CFOO (pronounced C’est fou) – le Club Fabuleux des Orateurs et Oratrices! Throughout the year, students will present eight short presentations. Some presentations are researched-based, some are opinion-based, and the rest are creativity-based. The first CFOO will take place Monday, November 14 – lots of time to prepare! Students must choose something from the Recherche category. Remember, students: Presentations should be between 1 and 2 minutes maximum…and practice is essential to success. Coming soon… English speech and debate, also known as The Loudspeakers!